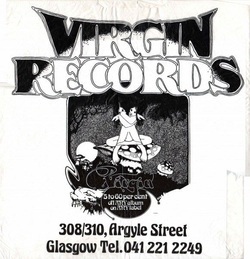 Galsgow Virgin a genuinely exciting shop when it first opened. Tons of non-mainsteam records* and a fairly subversive attitude. Originally had a cloakroom at the door to deter shoplifters. For a while had it's own head shop concession (stone age) selling dope relater paraphernalia. Needless to say went downhill after a massive corporate makeover. Comment Jay Kay.